In order to keep your motor in top running condition, you need a good set of bearings. Occasionally, after a crash or landing in the dirt, the bearings can become damaged and need to be replaced. The Scorpion S-50mm Motor Bearing Kit includes a pair of original equipment replacement bearings to fit the Scorpion S-5030 Series motors. 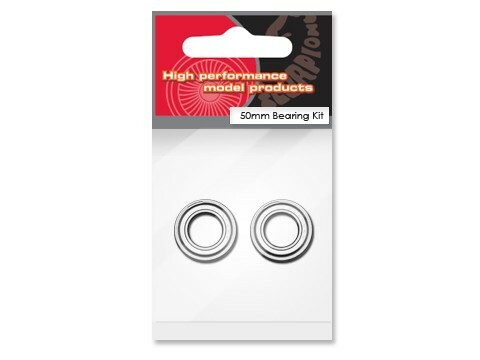 These bearings measure 19mm OD x 10mm ID x 5mm thick, and are an exact replacement for the stock bearings that come with the motors. Please note, the bearings are an exact fit into the motor housings, so they do fit snugly. When removing the old bearings, you may need to gently tap them out. However, when installing the new bearings, do not tap them in with anything, as this can dent the ball races and ruin the bearings. When installing ball bearings they need to be pressed in by the outer part of the race. Never apply pressure to the inner race, as this can damage the bearing and lead to premature failure.